BEST FIGHTER FOR CANADA: Meteor vs. AMRAAM... Minor upgrade or paradigm shift? Meteor vs. AMRAAM... Minor upgrade or paradigm shift? European nations have been quick to embrace the MBDA Meteor as their preferred BVR A2A missile. Integration testing is underway for the Eurofighter Typhoon and already completed for the Saab Gripen. The Rafale is planned to provisions to carry two Meteors by 2018. American fighter manufactures do not seem to be as enthusiastic, however. There appears to be no plans as of yet to integrate the Meteor with the F-15, F-16, or F/A-18. There has been talk about a variant of the Meteor "clipped" to fit inside a F-35's weapon bay, but no funding has been approved for this project thus far. For the time being, the USAF, USN, USMC, as well as the RCAF will be sticking with the AIM-120 AMRAAM (advance medium range air to air missile). The latest version, the AIM-120D, will be the "default" air-to-air weapon for the F-35 Lightning II. So what is the difference? Is the Meteor really that much better than the battle-tested AMRAAM? 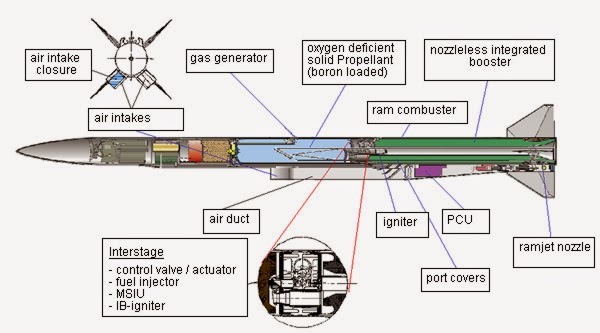 What sets the Meteor apart is its method of propulsion. Whereas traditional air-to-air missiles utilize solid-fuel rocket engines (similar to a model rocket), the Meteor uses a ramjet engine along with a solid-fuel booster. The ramjet has two major advantages over a traditional solid-fuel rocket. First, it does not need to carry an oxidizer, as it simply uses the incoming air. Second, a ramjet's burn rate is able to be throttled. This means the Meteor can accelerate at an optimum rate depending on a target's range, speed, and position. AMRAAM mounted on F-35 bay door. AMRAAM operation is relatively straight forward. Targeting data is sent to the AMRAAM's guidance computer just before launch. The missile is dropped, its solid-fuel rocket ignites, and it flies to where the target should be. Like the Meteor, it can use a two-way datalink to give and receive target updates while on its intercept course. When the AMRAAM gets close, it activates its own active radar in order to guide itself the rest of the way. Once the AMRAAM is fired, its solid-fuel rocket engine will accelerate the missile at a fixed rate until the missile either reaches its target or its fuel runs out. After this point, the missile can "glide" the rest of the way. Even without fuel, the AMRAAM still has plenty of kinetic energy traveling at Mach 4. Don't get excited. It's only a model. When fired, the Meteor first accelerates by use of its solid-fuel booster. This is needed because ramjets require a minimum speed in order to work properly. Once up to speed, the intake doors open, allowing supersonic air to enter the ramjet. As this air is "squeezed" into the ramjet, it becomes hot and ignites propellant, providing thrust to the missile. 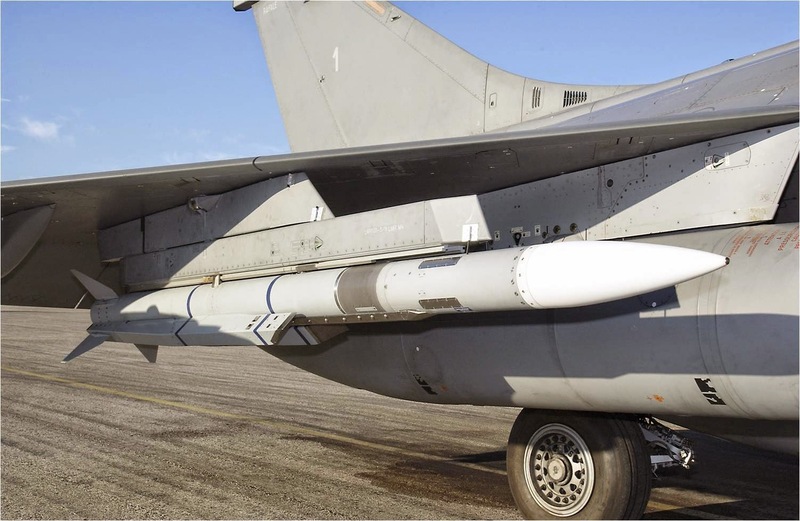 Like the AMRAAM, the Meteor's guidance system, aided by a two-way datalink (one-way in the Rafale) calculates the optimum flight path and thrust needed to intercept the target. When close enough, the Meteor's active radar takes over. Unlike the AMRAAM, the Meteor can increase or decrease its thrust in order to facilitate range or maneuvering. The goal is to reach the target while maintaining as much energy as possible. In theory, the Meteor will intercept its foe just as it is running out of fuel. When researching missiles, one can often see the maximum range of an air-to-air missile. This maximum is rather trivial, as the range given is under optimal conditions. This means a non-evading target traveling head-on with both fighters at high altitude. While some sources may depict a missile as having a range of over 100km or even more, the practical range of an air-to-air missile is much less. The more important indicator of an A2A missile's performance is its "no escape zone". 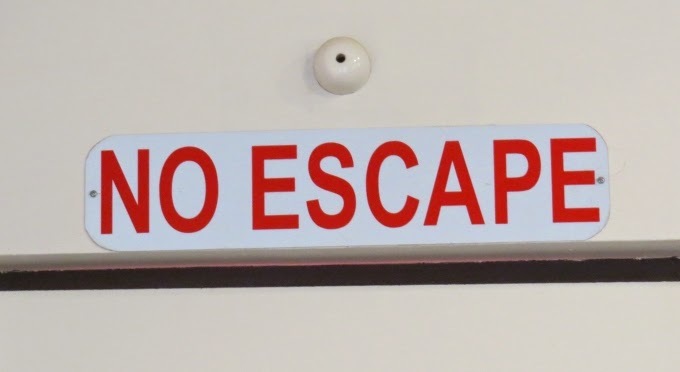 Not be be confused with "The Danger Zone" or "The Friend Zone"
A missile's "no escape zone" is not the range at which a successful hit is guaranteed. It is merely the range between the missiles minimum range and "turn and run" range (Rtr). The Rtr is the range at which a target can avoid being hit merely by flying away from the missile. At this range, the missile only has enough energy to intercept the target if the target remains at its current course and speed. For a better understanding of different missile range terminologies: Click here. The above depicts the Dynamic Launch Zone (DLZ) symbology that would be depicted on a pilot's HUD. Raero is the maximum range of the missile, including a brief period of climb to gain additional kinetic energy. Ropt is the optimum range, allowing the missile to maneuver during the terminal phase of the interception. Rpi is similar to Ropt but does not require the missile to climb to increase altitude first. Rtr is the range at which the target can no longer turn and run from the missile. Rmin is the minimum range of the missile, anything closer and bad stuff happens. 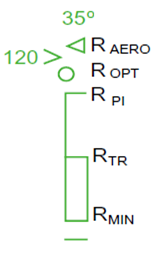 Targets in the "no escape zone" between Rtr and Rmin can still avoid interception. Countermeasures, such as a towed decoy can throw off targeting. Defending aircraft can also pull a "slice" maneuver, causing the missile to overshoot it. The missile would then need to expend precious energy to get back on target. All this adds up to a missile's probability of kill, or Pk. 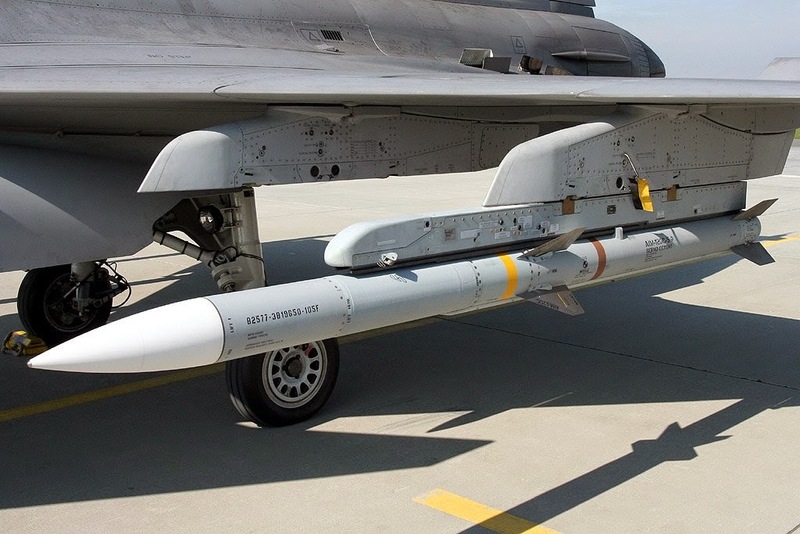 Since its introduction, the AMRAAM has demonstrated a Pk of about 46% when fired beyond visual range. In all of these cases, the targets were not equipped with radar warning receivers (RWRs), were not performing evasive maneuvers, or even engaging their attacker. One of these "kills" was a friendly fire incident on a Black Hawk helicopter. 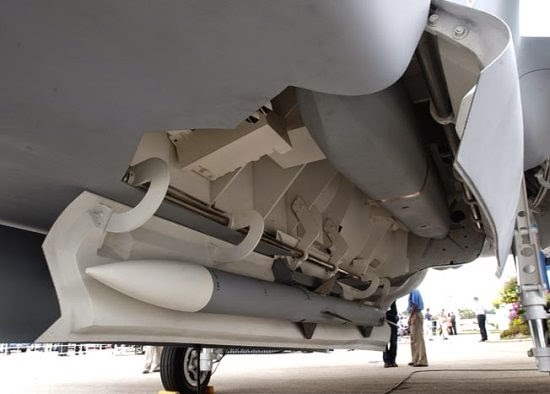 Needless to say, the AMRAAM's Pk against a maneuvering target equipped with an RWR would be much lower than the current 46%, even with advances to the missile's guidance and rocket. In fact, the AMRAAM has been described as the "Achilles Heel of the U.S. fighter fleet". So how is the Meteor better? By utilizing a more flexible ramjet, the Meteor promises to not only have an increased range (maximum range has not been released), but triple the no escape zone of the AIM-120 C-7. With the ability to modify its speed as it flies, the Meteor is much better suited for intercepting a maneuvering target. With triple the NEZ, the effective range of the Meteor is much higher. 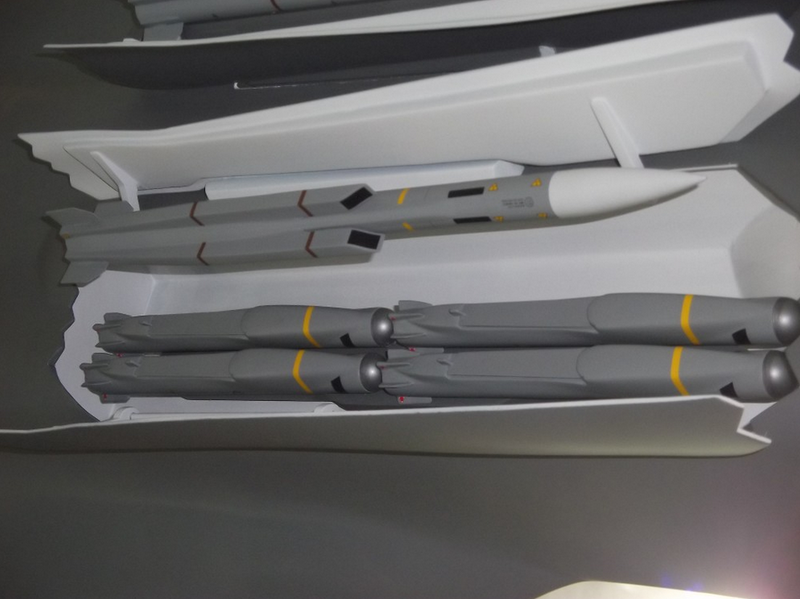 In comparison, the newest AMRAAM, the AIM-120D promises 50% more range than its predecessor, and an "improved" Pk. That still requires a stealth fighter to approach uncomfortably close to a target in order to get it within the no escape zone (NEZ). This is not necessarily an issue for the supercruising and super maneuverable F-22, but a slower, less agile fighter may have trouble. Further improvements to the AMRAAM, including possible ramjet propulsion have been put on hold thanks to sequestration. Conversion to AIM-120D standard likely will not occur until 2022. Meanwhile, Sweden's Gripen fleet will be outfitted with Meteors as early as next year. The MBDA Meteor is obviously the future. In not, the Pentagon would not be looking at ramjet propulsion for the AMRAAMs replacement. Russia also has a ramjet powered R-77PD in the works. A ramjet simply adds more flexibility than a solid rocket design. While it is often entertaining to compare individual fighters, it is important to remember that they are one part of a weapon system. As technology and computing power increase, missile advancements will outpace that of the fighters that carry them. An older fighter carrying cutting edge missiles will likely have an advantage over a modern fighter carrying obsolete weapons. With the USA cutting its missile development budget to fund the JSF, one wonders if they have their priorities straight.